Pole Physics is the only product in the world designed to improve the health of your skin when you pole dance. Why? ... because healthy skin grips better than dry skin - naturally! Developed by Australian pole dancers with a love for natural, healthy products. Pole Physics is the only no-slick, non-slip body lotion designed specifically to be used by polers. Pole Physics™ is not a grip aid, & you can still use your favourite grip product! Pole Physics is a body lotion that will allow you to benefit from your skin's natural ability to grip. 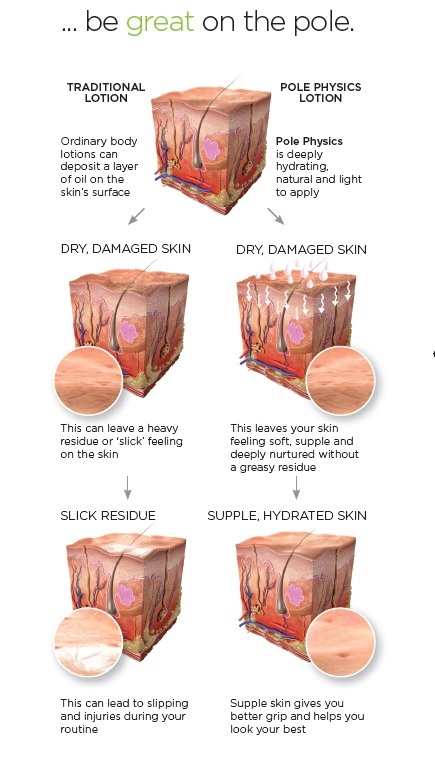 Healthy skin grips better than dry skin. Dry scaly skin will cause you to be much more slippery on the pole. It is the world's first body lotion engineered for the specialised needs of pole dancers & performers. Before Pole Physics we were all told not to moisturise in case we slipped on the pole. But now you can look after your skin & perform well on the pole! Designed for you to apply every day after your shower – and formulated for maximum moisture absorption, POLE PHYSICS is a specialised no-slick, non-slip body lotion that is engineered for hydrated, supple skin (without the ‘slick’ residue). If you use the product every day (after showering when your pores are open) you will notice a massive difference in only a few weeks.